Venturers raft on the New River. BSA photo by Al Drago. Earlier that morning, Scouts and Venturers waited 20 minutes in line, had their paperwork checked, chatted with fellow rafters-t0-be, and took in a 15-minute safety presentation. Boarding blue and white busses, they collectively bolstered courage and cheered as they rolled off the Summit Bechtel Reserve and onto the highway. As the driver whiped around turns through the West Virginia Mountains, some wondered if river will be quite as wild as the bus ride. Approaching the New River, a feeling of unease settled over the Scouts and Venturers as they try to be brave in the face of uncertainty. No one really wants to say that they're scared, but it was easy to notice real fear in some of their faces. Finally at the shoreline, groups of seven or eight board the waiting rafts. They are anxious to be on the water. The guide stands and chuckles eerily, like a pirate. He has 24 years of experience on the river, interrupted by two tours of service in Afghanistan. One rule is established for the raft... "keep your hand on the T-grip." He tells a story of Old Man Rudy who did not like rafters and would fire off his shotgun to scare them. As the rafts launched from the shore, the guide talked about geological history, the biology of the environment, the cultural history and the rapids themselves. The first set of rapids, known as "Rudy's Ripple," gives a team a glimpse of whitewater downstream. The river, a bit higher than usual because of the recent deluges of rain, is brown but still boiling and swirling. The raft lurched and bumped as Scouts and Venturers hung on. 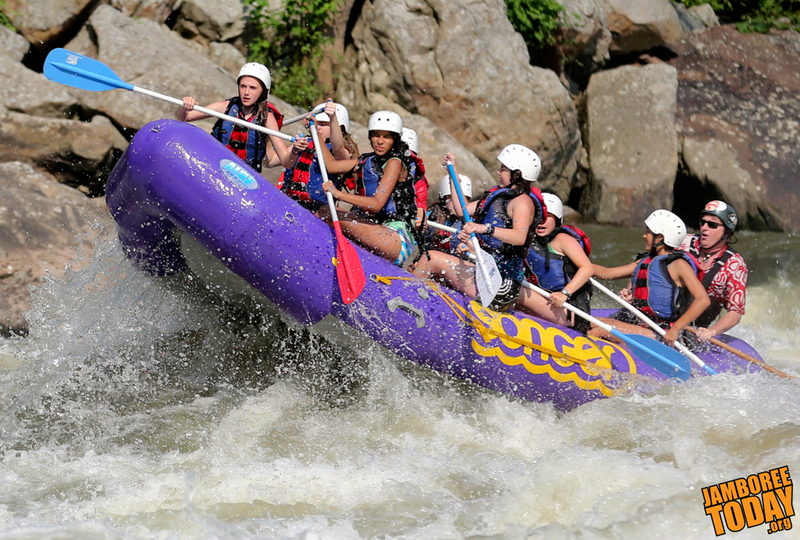 The guide's description of the upcoming "The Surprise" rapids fueled excitement among the passengers. Sure enough, holding on to the T-grip wasn't so easy this time. Splashes of water came over the raft. Laughter and shrieks poured out unsolicited. After failing to hold on tight enough to the side of his raft, Eagle Scout Chris Katzer of O'Fallon, Ill., tumbled over the side into the New River. "It went bump, bump, and then I fell out," said Katzer. Finally, it was calm. The guide stands up at the aft of the raft and hurls his feet over his head, doing a back-flip into the river. The rest of the rafters follow suit, assuring a fully drenched experience on the New River. "I wish I could do it again," Scout Tristen Gutbezahl. This was prevailing response among the now-dripping rafters. Scouts and Venturers who missed rafting on the New River's whitewater are encouraged to return to the Summit for the summer programs starting in 2014, which will also feature biking, hiking, climbing, shooting sports, and other specialized activities not offered at any other Boy Scouts of America national high adventure base. Whitewater rafting will also be available at the 2017 National Scout Jamboree.